Yesterday, I told you that land and property professionals have been using Application Enquiry to reduce the time and cost of their conveyancing. This week, we offer five tips that will help professionals get the most from the service. 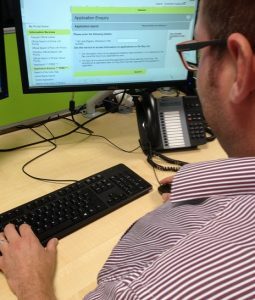 The advice in this blog builds on the step by step instructions in our Application Enquiry user guide and adds some context. Please note that where we refer to ‘you’, we are assuming you are a land or property professional with access to the HM Land Registry portal, our online transactional channel. We are also assuming you have some knowledge and experience of using the service. You can use your HM Land Registry Reference (we usually supply this when you send us your application) to search for your applications. In some situations, this can help you find what you are looking for quicker than if you search by title number. Why? Because the HM Land Registry Reference is unique to each individual application, whereas a title number could have several applications against it. When you search by HM Land Registry Reference, you are taken directly to the 'application details’ screen, so you won’t have to scroll through the list of pending applications against a title to find the one you are looking for. The application details screen shows you whether we have completed or cancelled the application (if you search within 30 calendar days of the date you applied), and where we have sent any documentation. We cannot display this information when you search by title number! Searching by HM Land Registry Reference is especially useful if you are trying to find out about a new title application and you don’t have a title number yet. When you reach the application’s details screen, you will see its title number if we have allocated one. You can then click on this to go to the list of other pending applications against that title. You can create a permanent record of an application’s details with the ‘Save as PDF’ function. easy to save the PDF to a folder or location of your choice. I hope you have found these useful, and we’ll be back tomorrow with three more tips. Subscribe to our blog posts to make sure you don’t miss them.